One major airline will bear the brunt of the damage from Brexit. But one small airline could actually profit from the recent turmoil. On Thursday, voters in the United Kingdom narrowly approved a referendum to leave the EU. The unexpected result has already inflicted turmoil on global financial markets. The ultimate economic impact of the U.K. exiting the EU is still hard to discern. Some airlines are likely to be negatively affected by the decision. Others won't feel much of an impact at all -- or could even benefit. American Airlines (NASDAQ:AAL) is likely to be a big loser from "Brexit." By contrast, Hawaiian Holdings (NASDAQ:HA) could be one of the few beneficiaries. Among U.S.-based airlines, American Airlines has the largest presence in the United Kingdom, representing more than 6% of its total capacity. Together with joint venture partner British Airways, it holds a dominant share of the U.S.-U.K. travel market, especially the key New York-London route. American Airlines has more U.K. exposure than other U.S. airlines. Image source: American Airlines. Flights to London's Heathrow Airport have traditionally been very profitable due to high business travel demand and tight capacity constraints at Heathrow. In Q1 2016, the transatlantic region was by far the strongest geography for American Airlines, due in part to solid demand for flights to the U.K. Unfortunately, the Brexit vote has created a lot of uncertainty for businesses. Falling business confidence typically leads to lower corporate travel spending, as companies try to cut non-essential costs. For the U.S.-Heathrow market, which depends heavily on premium demand, corporate travel cutbacks could have a big impact on unit revenue. Additionally, the British pound has fallen sharply relative to the U.S. dollar since the vote results came out. This will cut into the revenue American Airlines receives for tickets sold in the U.K. Finally, some commentators expect the British economy to fall into recession due to the Brexit vote. That would further dampen demand. There could be some offsetting factors. Most notably, the weaker British pound will make it cheaper for Americans to visit the U.K., potentially boosting travel demand in that direction. However, U.S. carriers hoping for a similar benefit in continental Europe last year were disappointed: The weak euro hurt travel demand from Europe to the U.S. much more than it increased demand in the opposite direction. In short, Brexit is likely to add to American Airlines' unit revenue struggles. Not surprisingly, investors ran for cover, sending the stock down 11% on Friday. For Hawaiian Airlines, the picture is a lot brighter. First, Hawaiian doesn't fly to the U.K. Second, it primarily carries leisure travelers, so a fall in business confidence shouldn't have much impact. While Brexit could have broader economic repercussions, it isn't likely to hurt demand for Hawaii vacations very much. Meanwhile, the turmoil surrounding Brexit has spearheaded a "flight to safety" in the currency markets. 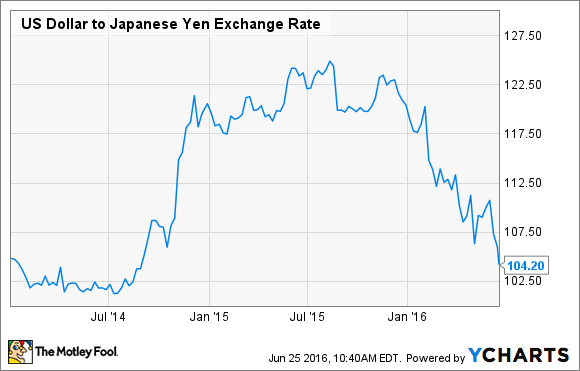 As a result, the Japanese yen, traditionally seen as a safe-haven currency, strengthened to its highest level against the dollar since mid-2014. This is important because Japan is Hawaiian Airlines' largest international market. In fact, it's about to get larger. Hawaiian plans to add a new daily flight from Tokyo's Narita Airport to Honolulu next month. It also hopes to add a second daily flight from Tokyo's Haneda Airport to Hawaii later this year. Together, these routes would nearly double Hawaiian Airlines' capacity from Japan. In the past few years, a falling yen has repeatedly pressured Hawaiian Airlines' unit revenue. By contrast, the yen has now appreciated by about 20% against the dollar over the past year, ending last week at 102 yen/dollar. Not only does that raise the value of yen-denominated ticket sales, it also makes it cheaper for Japanese tourists to visit Hawaii. The rising yen is likely to drive strong unit revenue growth for Hawaiian Airlines in Japan, just as it expands its presence there. This should more than offset the modest negative impact of Brexit on the carrier's other markets. The good news for airline investors is that while the airline industry is very capital-intensive, those capital investments are mobile. Hawaiian Airlines has made frequent changes to its international route network in recent years as market conditions have evolved. If there is a slump in the British air travel market, American Airlines can do likewise, redeploying some capacity to better-performing markets. Additionally, the Brexit vote caused oil prices to slump 5% on Friday. If oil prices continue to trend lower, that will help offset any Brexit-related revenue weakness. Still, for airline investors, Hawaiian Holdings looks like the better bet right now. In an environment where unit revenue is eroding for many airlines, Hawaiian sits in a privileged position due to the healthy supply demand dynamics in most of its key markets.